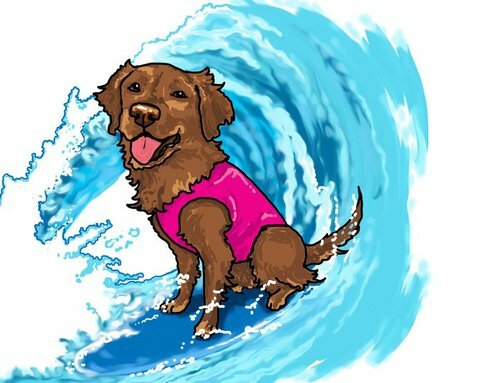 When Surf Dog Ricochet was eight weeks old, in addition to her service dog task training, she began balance and coordination training on a boogie board in a kiddie pool. Then, in the spring of 2009, she began going out to Fiesta Island, taking small paw steps before taking the giant leap to the ruff waters of the ocean. She had been in the ocean about three times when she got a last minute call to compete in the Purina Incredible Dog Challenge Surfing dogs Competition on June 12, 2009. She was still quite a novice grom at 15 months old, but managed to win 3rd place in the large surfing dog category. She was only one point off from the 2nd place winner. Not bad for a new surf dog amongst the more experienced surfing dogs. Surf Dog Ricochet was one of the original southern California surfing dogs when dog surfing competitions started. She competed for several years, and typically won first, second or third place, including the Loews Coronado Bay contest (now called Unleashed by Petco Competition), the Helen Woodward Surf Dog Surf a Thon, Surf City Surf Dog and the Purina Pro Plan Incredible Dog Challenge. Some of the dog surfing contests held fundraisers in conjunction with their events, and Surf Dog Ricochet was always the top fundraiser. She also surfs for fun, but her passion is surfing with purpose... focusing on people with disabilities, and kids with special needs in a non traditional way! 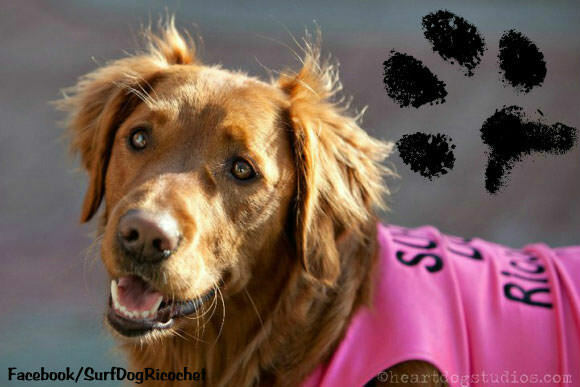 ​In addition to Ricochet's surfing, she's raised more than $500,000 for over 250 different human & animal causes. She also inspires people to allow themselves and others to be who they truly are... without judgment or intention to change. To focus on what they CAN do, which allows for a celebration of pawmazing outcomes! She promotes staying true to yourself, anti-bullying, kindness, charity, philanthropy, and social responsibility. ​“Here's to the crazy ones. The misfits. The rebels. The troublemakers. The round pegs in the square holes. The ones who see things differently. Well, Ricochet isn't "people", but she certainly sees things differently, does things differently and no matter what, she stays true to herself and her purpose so she can change the world! She was told she couldn't be a service dog because she likes to chase birds. So, she did something different than the status quo. She jumped on a surfboard, and has been surfing with people with disabilities ever since. Plus, as the years went by, she started helping military with PTSD as a service dog. So, she went full circle! She's an empath, and has been blessed with the ability to instantly bond with anyone she interacts with. She intuitively knows exactly what each individual needs, even if they don't. In her world, she does things differently than most. She has her own ideas, beliefs and life purpose. She doesn't follow the status quo. 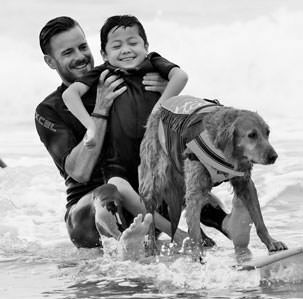 Because of Ricochet's unique, and highly skilled background of service, therapy and surf dog training, She's the only SURFice dog® on the planet who surfs with kids with special needs, people with disabilities, wounded warriors and veterans with PTSD. 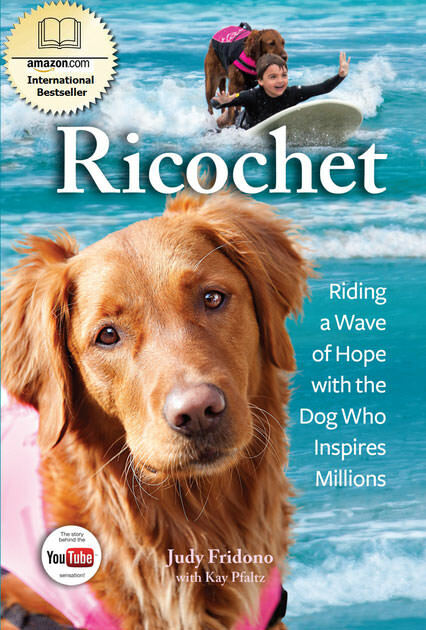 ​Ricochet has been featured in hundreds of media sources all over the world showcasing and raising awareness of her causes and surfing, such as the Associated Press, The Oprah Winfrey Network, The Today Show and many more. For a complete list with links, please visit her news page. Ricochet is living proof that if you let go of your expectations, and let others be who they truly are... it may turn out better than you could have ever imagined! If you have a dog... a cat... or any other animal... or even a human, please give them a chance! Give yourself a chance... live your life true to yourself, and not the life others expect of you. ​Ricochet is also a model, actor, author & celebrity. She's available for casting calls, TV, commercials, ​films, documentaries, live appearances and more.